For testing the performance of our Penning ion sources we have the possibility to test under operation conditions in a dedicated test bench, which was reconstructed recently and is similar to the injector setup. The ion source is placed in a dipole magnet which accomplishes charge separation after extraction of ions from the plasma. Behind the magnet diffrent test setups are possible including quadrupole magnets and diagnostic chambers with different diagnostics like beam trafos, Faraday cups, scintillating screen etc. as well as an emittance meter. For testing the performance of our Compact Penning Ion Sources. For research and development purposes an ECR injector setup (EIS) was established which is equipped with the same type of CAPRICE ECRIS, analyzing system and computer control as the HLI injection line. 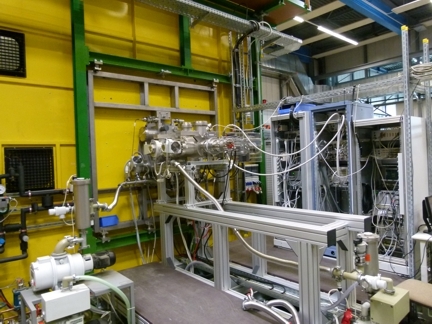 The beamline consists of a solenoid lens forming an intermediate focus of the extracted ion beam which is the virtual object for the sophisticated mass/charge analyzing system. It comprises a magnetic quadrupole lens and a dipole spectrometer split into two sectors of 67.5° bending angle providing image correction and a high mass/charge resolution. The EIS provides different microwave transmitter systems for plasma generation covering a frequency range from 8 to 18 GHz and RF power of up to 2000 W. They are capable to operate in cw mode and with various pulsed beam options. The EIS is equipped with versatile beam diagnostic tools like cooled Faraday cups, grid profile monitors, viewing targets for instantaneous beam visualization and pepper pot emittance meters for the characterization of ion beam properties and beam transport. The High current test setup allows to test ion sources and further developments offline without interrupting the operation at GSI main injector. The ion beam is extracted from the source, but there is no post-acceleration like in the main injector. The test bench is equipped with various diagnostics elements for ion beam current and geometric measurements. At the High Current Test Injector the aim is to find out the best working parameters of the ion sources including post-acceleration and beam formation. Testing diffrent beam transport elements is one of the main tasks in order to find an optimum solution for the new uranium injector for FAIR (Terminal West).